New Zealand Art Print News: Collecting prints from NZ Fine Prints? An update. Collecting prints from NZ Fine Prints? An update. Running a business in Christchurch as the city rebuilds is a challenge. It's exciting seeing the new buildings going up and houses finally being repaired. However the constant noise is wearing, roadworks droning on from streets away all day for weeks at a time, our new neighbour is having seemingly endless stone walls built, the tink, tink, tink of hammers and the snarl of stone cutting saws 8-6 six days a week for the past six months. Forced to relocate from the central city to Cashmere by the government's confiscation of our gallery's land for the "green frame" (now being developed by Fletcher's for housing) we now relish the 21st century way of doing business close to home. It seems like this is the way of the future for a specialised niche business that sells over the internet rather than through a traditional retail store (NZFP's roots are in mail order, not retail). 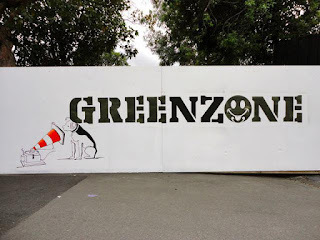 Just after NZ Fine Prints arrived at 139 Hackthorne Rd a previous neighbour called the council about Jason Kelly's "Greenzone" artwork on the plywood fence around our collapsed garage which they thought was too big for a "business sign" in our part of town. CCC officials then came out, said "Greenzone" was (of course!) 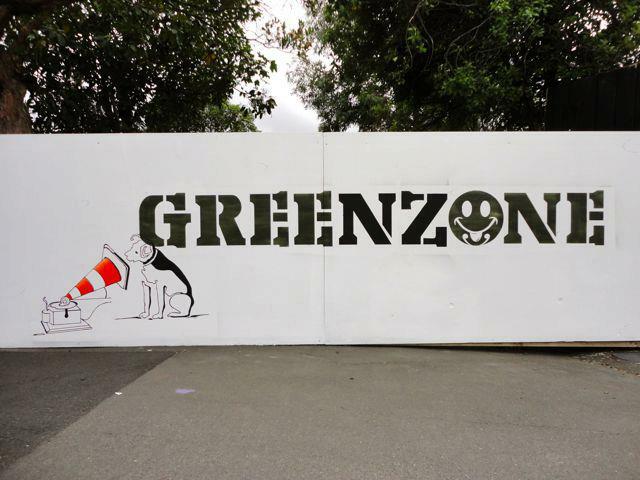 a piece of street art rather than a non-complying sign and they checked out that NZ Fine Prints complied with their regulations (employee numbers, selling online etc). They assured us that our business model fitted in with the pre-earthquake city plan and in fact, given our size and the reality that our customers purchased online rather than in store, we didn't even need a special post earthquake 5 year resource consent that some businesses had to apply for. Today we've had another neighbour on our shared driveway concerned about someone coming in to pick up a print they had ordered and parking for a few minutes in a shared area common to our three properties. Until we have our top garage rebuilt (which we are going to use for pickups and courier deliveries directly from Hackthorne Rd) we'd like to ask that customers collecting prints park at the top of our long drive and walk down if they are able to. A little bit of extra consideration that will help us harmoniously coexist with our neighbours until we get our top garage re-built which will move all business traffic off the driveway completely. Yes, we are still waiting for our insurance company to get on with our claim five years after the quakes - but we are confident this will be completed by the end of 2016. Thanks.